This is a title that is sure to spur some angry comments. Didn’t the financial crisis prove that mainstream macroeconomics was hopelessly flawed, that the ‘Great Moderation’ (fifteen or so years of relatively stable inflation and output) that preceded the crisis was a sham, or worse still a cause of the crisis, and basing policy on lots of maths and rational expectations has been totally discredited? One of the architects of that macroeconomic mainstream is Lars Svensson. He wrote a number of key papers on inflation targeting using lots of maths and rational expectations. Probably for that reason, he was a member of Sweden’s equivalent of the Monetary Policy Committee from 2007 to 2013. By the middle of 2009 Swedish short term interest rates were, like most other places, close to their ‘zero lower bound’ - in this case 0.25%. But in mid 2010 they began to rise again, reaching 2% at the end of 2011. The primary motivation for this continuing rise in rates was a concern that Swedish consumers were taking on too much debt. Svensson fiercely and publicly opposed these increases, and eventually left the central bank in frustration. He argued that there was still plenty of slack in the economy, and raising rates would be deflationary, so that inflation would fall well below the central bank’s target of 2%. By the end of 2012 inflation had indeed fallen to zero, and since then monthly inflation has more often been negative than positive. It was -0.4% in September. This week the Swedish central bank lowered their interest rate to zero. OK, so one eminent macroeconomist got a forecast right. Plenty of others get their forecasts wrong. Why the big deal? Suppose you took the statement in my first paragraph seriously. The Great Moderation was about central banks having an explicit forward looking target for inflation, and varying interest rates with the aim of trying to achieve it. So if the success of that policy was a sham or worse, and had been exposed by the financial crisis, a central bank should not worry too much if they abandon it. They should certainly not worry if they deviate from it because of concerns about the financial health of the economy. Which is exactly what the Swedish central bank did. Now Sweden has negative inflation, and interest rates have come right back to zero. Deviating from what mainstream macroeconomists in general advocate (and what one in particular recommended) has proved a costly mistake. (Svensson estimates it has cost 60,000 jobs.) So maybe the story with the financial crisis is a little more nuanced. Perhaps good monetary policy, aided by the analysis of mainstream New-Keynesian theory, did help bring about the pre-crisis moderation in inflation and output variability. The Achilles heel was that monetary policy lost traction when nominal rates hit zero, but a number of mainstream macroeconomists had discussed the implications of that possibility before it happened in 2009. In the UK at least (and also elsewhere), it was politicians and central bank governors that did not take the consequences of this possibility seriously enough. The financial crisis suggests that what was missing was better financial regulation (including macroprudential monetary policy tools), rather than a need to rewrite how we set interest rates. I am certainly not claiming that mainstream macroeconomics is without fault, as regular readers will know (e.g.) However it is important to recognise the achievements of macroeconomics as well as its faults. If we fail to do that, then central banks can start doing foolish things, with large costs in terms of the welfare of its country’s citizens. And while it might appear unseemly to occasionally blow one’s own profession’s trumpet, I suspect no one else is going to. Everyone knows that the Eurozone suffered a crisis from 2010 to 2012, as periphery countries could no longer sell their debt. A superficial analysis puts this down to profligate governments, but look more closely and it becomes clear that the formation of the Euro itself led to an excessive monetary stimulus in these periphery countries. This is widely understood. But this is not the whole story. It leaves out one key element that is vital if we are to understand the situation today. Here is a chart of nominal wage growth (compensation per employee) in the Eurozone and selected countries within it before the Great Recession. Between 2000 and 2007 German wages increased by less than 10% compared to over 20% in the Eurozone as a whole (which of course includes Germany). This difference was not primarily caused by excessive growth in the periphery countries: wages in France, Belgium, the Netherlands, Italy and Spain all increased by between 20% and 30%. The outlier was Germany. So the reason why Germany seems to have largely escaped the second Eurozone recession of 2012/3 is that it pursued (perhaps unintentionally) a beggar my neighbour policy within the Eurozone. Low nominal wage growth in Germany led to lower production costs and prices, which allowed German goods to displace goods produced in other Eurozone countries both in the Eurozone and in third markets. This might make sense if Germany had entered the Eurozone at an uncompetitive exchange rate, but my own analysis suggests it did not, and Germany’s current relative cyclical position and its current account surplus confirm this. As I argued in an earlier post, I do not think this divergence in cyclical position is the main reason why Germany resists expansionary measures in the Eurozone. But it is a lot easier to take up these obstructive positions when you are benefiting from this beggar my neighbour policy, and other countries that have suffered as a result appear not to understand what you have done. One of the comments on my earlier post tried to justify this beggar my neighbour policy using the following argument. Although the ECB's inflation target was close to 2%, they suggested that inflation below this was clearly desirable. What the Eurozone provided was an incentive system to try and achieve below target inflation by becoming more competitive. Germany had successfully risen to this challenge, and now it was up to other countries to try and do the same. Now if this competitiveness had been achieved by improvements in productivity, then this idea - although still mistaken - would be worth discussing. When it is achieved by cutting nominal wages (such that real wage increases are below productivity growth), it is not clear what efficiency gains are being achieved. Postscript: Simon Tilford of the Centre for European Reform makes much the same argument here (HT Zoe Keller). When, almost a year ago, Paul Krugman wrote six posts within three days laying into the stance of Germany on the Eurozone’s macroeconomic problems, even I thought that maybe this was a bit too strong, although there was nothing in what he wrote that I disagreed with. Yet as Germany’s stance proved unyielding in the face of the Eurozone’s continued woes, I found myself a couple of months ago doing much the same thing (1, 2, 3, 4, 5, 6), although at a slightly more leisurely pace. Now it seems the whole world (apart from Germany, or course) is at it: here is a particularly clear example from Matt O’Brien. 1) ECB monetary policy has been far too timid since the Great Recession began, in part because of the influence of its German members. 2) This combined with austerity led to the second Eurozone recession, and austerity continues to be a drag on demand. The leading proponent of that austerity is Germany. 3) Pretty well everyone outside Germany agrees that a Eurozone fiscal stimulus in the form of additional public investment, together with Quantitative Easing (QE) in the form of government debt purchases by the ECB, are required to help quickly end this second recession (see, for example, Guntram Wolff), and the main obstacle to both is the German government. The question I want to raise is why Germany appears so successful in blocking or delaying these measures. At first the answer seems obvious: Germany is the dominant economy in the Eurozone. However that is too easy an explanation: while Germany’s GDP is less than a third of the Eurozone total, the combination of French, Italian and Spanish GDP is nearly one half. Now it could be that in the past France, Italy and Spain have failed to coordinate sufficiently to oppose Germany, in part because France has placed a high value on the French-German bilateral relationship. But that seems less of a problem today. The puzzle remains if we just view these debates as being about national interest, rather than a battle over ideas. Germany is virtually unique in the Eurozone in not currently having a large negative output gap, and having low unemployment. So, you could argue, it is not in Germany’s national interest to allow Eurozone demand to expand, and inflation to rise. But Germany achieved this position because it undercut its Eurozone partners by keeping wages low before 2007. If political discourse was governed by basic macroeconomics, you would expect every other country to be very annoyed that this had happened, and be demanding that Germany put things right by restoring a sustainable relative competitive position through additional inflation. These last two sentences contain a clue to resolving this puzzle. While nearly everyone recognises the internal competitiveness problem within the Eurozone, hardly anyone describes this as a problem caused by German policy. Instead, as Edward Hugh suggests for example, they believe “Germany’s unit labour costs are low not because Germans aren’t paid much, but because they are very productive, and at the end of the day, despite all the bleating about the current account this is the model other members of the Euro Area (including France) not only need to but are compelled to follow: high pay and high productivity”. I suspect many would agree with that sentiment. Unfortunately it misses the point. International differences in productivity occur for a variety of reasons, and they are slow to change. The Eurozone’s current problem arises because one country - Germany - allowed nominal wage growth well below the Eurozone average, which undercut everyone else. (This post shows how real wage growth in Germany was below productivity growth in every year between 2000 and 2007.) Within a currency union, this is a beggar my neighbour policy. In other words, as Simon Tilford suggests, Germany is viewed by many in the Eurozone as a model to follow, rather than as a source for their current problems. (He also plausibly suggests that Germany’s influence immediately after 2010 reflected its creditor position, but he argues that the importance of this factor should now be declining.) 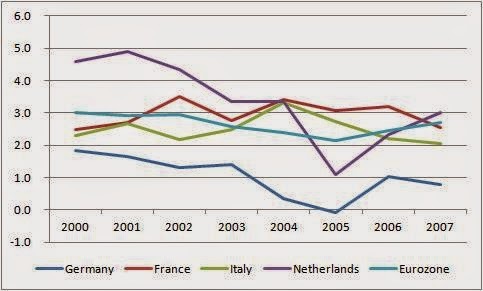 Of course in general terms Germany may well have many features which other countries might well want to emulate, like high levels of productivity, but the reason why it’s national interest is not currently aligned with other union members is because its inflation rate was too low from 2000 to 2007. That in itself was not a virtue (whatever the rights or wrongs of why it came about), and so if they had any sense other union members should be complaining bitterly about the German position. I think the current Eurozone problem makes much more sense if we focus less on divergent national interests, and more on different macroeconomic points of view. The German perspective which sees the Eurozone problem in terms of profligate governments and lack of ‘structural reforms’ outside Germany is utterly inappropriate in understanding the Eurozone’s current position. Yet it is a point of view that too many outside Germany also share. This is beginning to change. As this Reuters report makes clear, relations between Draghi and the Bundesbank have steadily deteriorated, as Draghi begins to understand the macroeconomic reality. (While I still have problems with the ECB’s current position, set out clearly in this speech by Benoît Cœuré, it makes much more sense than anything coming from the Bundesbank or German government.) Yet, as Simon Tilford notes, it is still not clear whether this will end in a significant departure from current policies, or just more of the minor adjustments we have seen so far. It may well come down to the position taken by countries like the Netherlands. They have suffered as much as France in following the Eurozone’s fiscal rules to implement damaging fiscal contraction. As Giulio Mazzolini and Ashoka Mody note, “For the Netherlands …. less austerity would have been unambiguously better.” Yet until now, politicians in the Netherlands (and the central bank) appear to have taken the German line that this medicine is for their own good. If they can eat a bit of humble pie and support a kind of ‘grand bargain’ that would see fiscal expansion rather than contraction in the Eurozone as a whole, and a comprehensive QE programme by the ECB, then maybe some real progress can be made. Ultimately this is not the Eurozone’s Germany problem, but a problem created by the macroeconomic vision that German policymakers espouse. I ought to start a series on common macroeconomic misunderstandings. (I do not watch zombie films.) One would be that the central bank’s balance sheet normally matters, although this nice comment on my last post does the job pretty well. Here is one that crops up fairly regularly - that government debt does not involve redistribution between generations. The misunderstanding here is obvious once you see that generations overlap. Take a really simple example. Suppose the amount of goods produced each period in the economy is always 100. Now if each period was the life of a generation, and generations did not overlap, then obviously each generation gets 100, and there can be no redistribution between them. But in real life generations do overlap. So instead let each period involve two generations: the old and young. Suppose each produced 50 goods. But in one period, call it period T, the government decides that the young should pay 10 goods into a pension scheme, and the old should get that pension at T, even though they contributed nothing when young. In other words, the young pay the old. A fanciful idea? No, it is called an unfunded pension scheme, and it is how the state pension works in the UK. As a result of the scheme, the old at T get 60 goods, and the young only 40, of the 100 produced in period T. The old at T are clear winners. Who loses? Not the young at T if the scheme continues, because they get 60 when old (and assume for simplicity that people do not care when they get goods). The losers are the generation who are old in the period the scheme stops. Say that is period T+10, when the young get to keep their 50, but the old who only got 40 when young only get 50 when old. So we have a clear redistribution from the old in period T+10 to the old in period T. Yet output in period T and T+10 is unchanged at 100. That example did not involve any debt, but I started with it because it shows so clearly how you can have redistribution between generations even if output is unchanged. To bring in debt, suppose government taxes both the old and young by 10 each period, and transforms this 20 into public goods. So each generation has a lifetime consumption of 80 of private goods. Now in period T the government says that the young need pay no taxes, but will instead give 10 goods in exchange for a paper asset - government debt - that can be redeemed next period for 10 goods. In period T nothing changes, except that the young now have this asset. In period T+1 this allows them (the now old) to consume 50 private goods rather than 40: the 40 it produces less tax and the 10 it now gets from the government by selling the debt. Their total consumption of private goods has increased from 80 to 90. How does the government obtain these 10 to give the now old? It says to the young: either you pay 20 rather than 10 in taxes, or you can buy this government debt for 10. As people only care about their total consumption, the young obviously buy the debt. They now consume 30 in private goods in T+1, but 50 in T+2 when they sell their debt, which gets us back to the original 80 in total lifetime consumption. This process continues until period T+10, say, when the government refuses to give the young the choice of buying debt, and just raises an extra 10 in taxes on the young. So the debt disappears, but the young are worse off, as they only have 30 of private goods to consume this period. Their total lifetime consumption of private goods is 70. We have a clear redistribution of 10 from the young in period T+10 to the young in period T enacted by the government issuing debt in period T.
If you are thinking that these redistributions need not occur if the debt is never repaid or the pension scheme never wound up, then we need to get a bit more realistic and bring in interest rates and growth (and the famous r<>g relationship), which these posts of mine (and these at least as good posts from Nick Rowe) discuss. But the idea with this post is to get across in a very simple way how redistribution between generations can work because generations overlap. In a previous post I speculated on how the disaffected voter could be both part of the UKIP story and also a factor behind the decline in the popularity of the LibDems. But what about UKIP’s two key policy areas: leaving Europe and stopping immigration? As I noted last time, for most UKIP voters Europe itself is no big deal. It is an issue which will sit naturally with disaffected voters: if UK politicians seem remote to their interests, politicians in Europe will seem even more so. It is not an issue that a large number of voters will regard as all important in itself. Immigration is much more interesting. This post looks at what evidence we can get from surveys about voter attitudes towards immigration. This chart is a little busy, but the green line is the number of people rating race and immigration as one of the top issues. The issue was nowhere until the end of the 1990s. Within the space of about four years its importance rose dramatically, and it has stayed as a key issue since around 2003. The temporal link with actual levels of migration cannot be a complete coincidence. 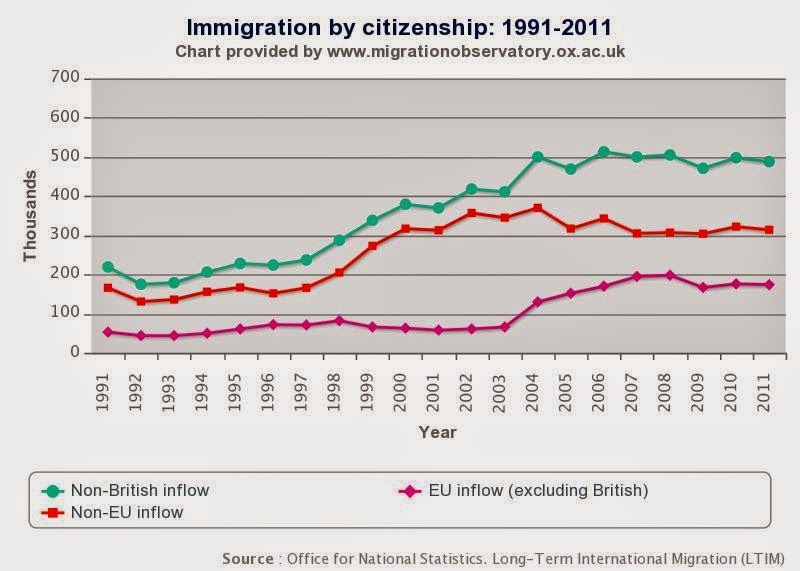 Note that immigration from the EU only took off from 2004. So freedom of movement for labour within the EU, which is discussed so much in the media, is not the key to understanding voter concern about immigration. Nor does concern about immigration appear to involve class. Any differences between the standard social classifications (A-E) and voter concern seems to be swamped by a common movement, as this chart shows. There is, however, an understandable difference between income groups when they are asked why they are concerned about immigration. Those with low incomes tend to want to reduce immigration because of the perceived impact on jobs and housing, while those on higher incomes are more concerned about the impact on public services. Location is also important. One widely reported result is that concern about immigration tends to be higher where actual levels of immigration are low. (An exception seems to be where asylum seekers are placed.) Many have noted that UKIP’s first MP is in a constituency where levels of immigration are very low. Chris Dillow mentions one poll that found that while 76% think immigration is a very or fairly big problem for Britain, only 18% think it is in their own area. Furthermore those with migrant friends were far more likely to be positive about the impact of immigration than those without. So immigration for many is about a fear rather than perceived experience. The fear is fed not by official statistics but stories in the media. In that sense it is like crime. In the case of crime, the general perception is that crime is rising, even though for many years nearly every type of crime has been falling in the UK. This encourages politicians to focus on the appearance of action: most calculate that they are better off talking about 'cracking down' on crime than in celebrating its decline. With immigration, the political benefits of appearing to 'deal with the problem of immigration' are greater than arguing that, in average economic terms at least, immigration may not be a problem at all. Two things make immigration particularly toxic as a political issue. The first is that economic issues (jobs, housing, public services) can so easily be linked to it. However the first chart should warn against a belief that immigration concerns will disappear if real wages begin to rise. The second is the link with EU membership. While it is clear that public concerns about immigration became important long before immigration from the EU rose substantially, it suits those that want us to leave the EU to suggest that EU immigration is critical to public perceptions on this issue. For that reason, it seems unlikely that the political 'problem of immigration' is going to go away as long as the UK remains in the EU. If this last statement is true, there is an interesting implication. UKIP can continue to receive strong support by saying that they have the only certain way of 'tackling immigration', and this will be true whatever actually happens to the numbers (immigration is like crime). The question that then arises is whether the Conservative party can live with that. Promising a referendum and then staying in the EU may win the next election but it will not make UKIP go away. Instead the party may calculate that the only way of making the issue of immigration less toxic is to take the UK out of the EU. Oxford’s Migration Observatory, Ipsos-Mori and the British Social Attitudes survey. Suppose you had just an hour to teach the basics of macroeconomics, what relationship would you be sure to include? My answer would be the Phillips curve. With the Phillips curve you can go a long way to understanding what monetary policy is all about. My faith in the Phillips curve comes from simple but highly plausible ideas. In a boom, demand is strong relative to the economy’s capacity to produce, so prices and wages tend to rise faster than in an economic downturn. However workers do not normally suffer from money illusion: in a boom they want higher real wages to go with increasing labour supply. Equally firms are interested in profit margins, so if costs rise, so will prices. As firms do not change prices every day, they will think about future as well as current costs. That means that inflation depends on expected inflation as well as some indicator of excess demand, like unemployment. Microfoundations confirm this logic, but add a crucial point that is not immediately obvious. Inflation today will depend on expectations about inflation in the future, not expectations about current inflation. That is the major contribution of New Keynesian theory to macroeconomics. This combination of simple and formal theory would be of little interest if it was inconsistent with the data. A few do periodically claim just this: that it is very hard to find a Phillips curve in the data. (For example here is Stephen Williamson talking about Europe - but see also this from László Andor claiming just the opposite - and this from Chris Dillow on the UK.) If this was true, it would mean that monetary policymakers the world over were using the wrong framework in taking their decisions. So is it true? The problem is that we do not have good data series going back very far on inflation expectations. Results from estimating econometric equations can therefore vary a lot depending how this crucial variable is treated. What I want to do here is just look at the raw data on inflation and unemployment for the US, and see whether it is really true that it is hard to find a Phillips curve. 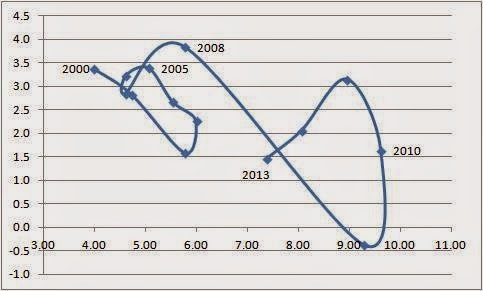 The first chart plots consumer price inflation (y axis) against unemployment (x axis), where a line joins one year to the next. We start down the bottom right in 1961, when inflation was about 1% and unemployment 6.7%. Over the next few years we get the kind of pattern Phillips originally observed: unemployment falls and inflation rises. The problem is that with inflation rising to 5.5% in 1969, it made sense for agents to raise their expectations about inflation. (In fact they almost surely started doing this before 1969, which may give the line from 1961 to 1969 its curvature. For given expectations, the line might be quite flat, a point I will come back to later.) So when unemployment started rising again, inflation didn’t go back to 1%, because expected inflation had risen. The pattern we get are called Phillips curve loops: falling unemployment over time is clearly associated with rising inflation, but this short run pattern is overlaid on a trend rise in inflation because inflation expectations are rising. Of course the other thing going on here is that we had two oil price hikes in 1974 and 1979. 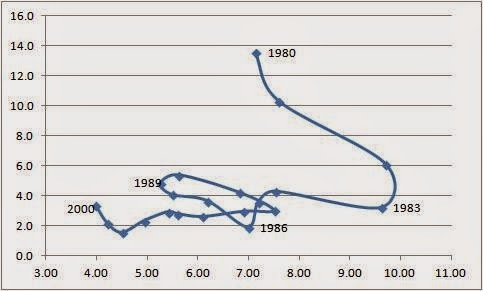 The chart finishes in 1980. Most economists agree that things changed in 1980, as Volker used monetary policy aggressively to get inflation down. 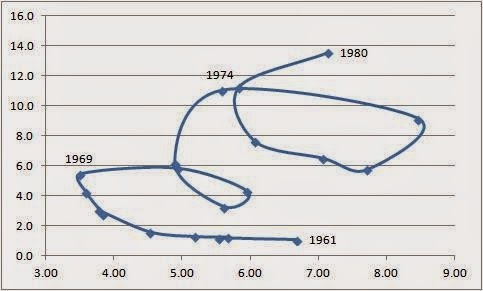 The next chart plots inflation and unemployment from 1980 to 2000. Inflation came down from 13.5% in 1980 to 3.2% in 1983 partly because unemployment was high, but also because inflation expectations fell rapidly. (We do have survey evidence showing this happening.) The remaining period is dominated by a large fall in unemployment. So why didn’t this fall in unemployment push inflation back up? In terms of the chart, why isn’t the 2000 point much higher? Again expectations are confusing things. One survey has inflation expectations at around 5% in 1983, falling towards 3% at the end of 1999. So inflation was being held back for that reason. A Phillips curve, and its loops, is still there, but pretty flat. The final chart goes from 2000 to 2013. Note that the inflation axis has changed - it now peaks at 4.5% rather than 16%. The interesting point, which Paul Krugman and others have noted, is that this looks much more like Phillips’s original observation: a simple negative relationship between inflation and unemployment. This could happen if expectations had become much more anchored as a result of credible inflation targeting, and survey data on expectations do suggest this has happened to some extent. There are also important changes in commodity prices happening here too. While the change in inflation scale allows us to see this more clearly, it hides an important point. Once again the Phillips curve is pretty flat. We go from 4% to 10% unemployment, but inflation changes by at most 4%. However from the previous discussion we can see that this is not necessarily a new phenomenon, once we allow for changing inflation expectations. Is it this data which makes me believe in the Phillips curve? To be honest, no. Instead it is the basic theory that I discussed at the beginning of this post. It may also be because I’m old enough to remember the 1970s when there were still economists around who denied that lower unemployment would lead to higher inflation, or who thought that the influence of expectations on inflation was weak, or who thought any relationship could be negated by direct controls on wages and prices, with disastrous results. But given how ‘noisy’ macro data normally is, I find the data I have shown here pretty consistent with my beliefs. If you see everything in terms of a left-right spectrum, then UKIP’s popularity seems to indicate a dramatic shift to the right. Here is the share of the popular vote gained in elections since 1945, but ending with an average of current polls. If we place the LibDems as somewhere near the centre of this spectrum, then we have a fairly even balance between parties of the right and left - until now. So has there been a sharp movement to the right among the electorate? UKIP policies are clearly to the right of the Conservatives. But it may be a mistake to confuse the party and its policies with the views of those currently voting for them. Here is Owen Jones noting how UKIP voters tend to want to renationalise the railways and energy companies, increase the minimum wage substantially, and keep the NHS within the public sector. Perhaps we should see UKIP as an anti-Europe party, something outside the left-right spectrum? Again the party is not the same as its supporters. Only a quarter of UKIP voters in this survey said resolving Britain’s future relations with the European Union is one of the three most important issues currently facing the country. Conservative MPs may be switching to UKIP because of Europe, but it is not clear that UKIP voters are. Before leaving this chart, we should note that the rise in UKIP is not the only recent dramatic change. The other is the decline of the LibDem vote. In the by-election where Labour only just retained their seat, we actually saw Labour keep its 2010 share of the vote. The gain in UKIP’s share was accounted for by a roughly equal decline in the share of the Conservatives and LibDems. As many Conservatives will have been voting tactically, we once again see an apparent shift from LibDem to UKIP. Now we know that around half of UKIP voters used to vote Conservative, not LibDem. We also know that a significant number of ex-LibDem voters (about a third?) have moved to Labour, as we might have expected as a result of forming a coalition with the Conservatives. But about 20% of UKIP voters who voted for another party in 2010 are ex-LibDem voters - that is about half a million voters. (The equivalent number for Labour is 15%) Anyone familiar with LibDem policies would be surprised the figure is this high: UKIP wants to leave Europe, but the LibDems have always been the most pro-Europe party. However this may be making the same mistake again: assuming that voters’ views map to party policies. Here is an alternative idea that might be part (and only part) of the story. (It is far from original - see Adam Lent for example.) An important underlying trend since perhaps the 1960s is the rise of the disaffected voter. These are voters with no strong ideological affiliations, and with little interest or knowledge of politics. What they do feel strongly about, however, is that politicians in power do not represent their views or interests, and that ‘they are all as bad as each other’. What will attract these voters are politicians who are not part of the ‘Westminster elite’, because they are untainted by government. This is not a peculiar UK phenomenon - not being part ‘of Washington’ is a constant appeal in the US. This, rather than policies, may be the key factor for these voters. The emergence of this group could explain some part of the rise in the LibDem vote since the 1970s. By joining the coalition after the 2010 election the LibDems not only lost their more left leaning supporters, they also lost the support of the disaffected voter, because they were now part of government. Very quickly their image changed from plucky outsiders to part of the Westminster establishment, and they could no longer be the party of the disaffected voter. But neither could Labour, who not only had been recently in government, but continued to behave as they did in government. The disaffected voter needed somewhere to go, and for some UKIP became their home. Of course a large part of UKIP’s support is from disgruntled Conservatives. But if that was the complete story, UKIP’s rise would only be a problem for the Conservatives, and Labour would be quietly encouraging UKIP. This is clearly not the case. If this idea of the disaffected voter sounds similar to the old idea of the protest vote, that is partly true, but with an important difference. Protest votes are generally assumed to melt away come general elections, but this will not be true of the disaffected voter. For that reason, expecting UKIP to fade away may be naive. By now you are probably screaming: what about immigration! I think immigration is the kind of the issue that the disaffected voter would focus on. But this post is already too long so my thoughts will have to wait, although I think Chris Dillow is on the right track. The debate about the current state of academic macroeconomics continues, but it has reached a kind of equilibrium. Heterodox economists, some microeconomists and many others are actively hostile to the currently dominant macro methodology. Regardless, academic macroeconomists in the papers they write carry on using, almost exclusively, microfounded DSGE models. Critics say this methodology was crucial in missing the financial crisis, but academic macroeconomists respond by highlighting all the work currently being done on financial frictions. I personally think missing the crisis was down to failings of a different kind, but that DSGE did hold back our ability to understand the impact of the crisis. However what I want to suggest here is a forward looking test. Many of the difficult choices in conducting monetary (and sometimes fiscal) policy involve trade-offs between inflation and unemployment. We saw this in the UK particularly after the crisis, with inflation going well above target during the depth of the recession. What you do in those circumstances depends critically on the costs of excess inflation compared to the costs of higher unemployment. Is 1% higher unemployment worth more or less than 1% higher inflation to society as a whole? What do New Keynesian DSGE models say about this trade-off? They do not normally model unemployment, but they do model the output gap, which we can relate to unemployment. Their answer is that inflation is much the more important variable, by a factor of ten or more. One reason they do this is that they implicitly assume the unemployed enjoy all the extra leisure time at their disposal. I have discussed other reasons here. Empirical evidence, and frankly common sense, suggests this is the wrong answer. Thanks to the emergence of a literature that looks at empirical measures of wellbeing, we now have clear evidence that unemployment matters more than inflation. Sometimes, as in this study by Blanchflower et al, it matters much more. Another recent study by economists at the CEP shows that “life satisfaction of individuals is between two and eight times more sensitive to periods when the economy is shrinking than at times of growth”, which as well as being related to the unemployment/inflation trade-off raises additional issues around asymmetry. So the DSGE models appear to be dead wrong. Furthermore the reasons why they are wrong are not deeply mysterious, and certainly not mysterious enough to make us question the evidence. For example prolonged spells of unemployment have well documented scarring effects (in part because employers cannot tell if unemployment was the result of bad luck or bad performance), which may even affect the children of the unemployed. So it is not as if economists cannot understand the empirical evidence. Does that mean that the DSGE models are deeply flawed? No, it means they are much too simple. Does that mean that the work behind them (deriving social welfare functions from individual utility) is a waste of time? I would again say no. I have done a little work of this kind, and I understood some things much better by doing so. Will these models ever get close to the data? I do not know, but I think we will learn more interesting and useful things in the attempt. The microfoundations methodology is, in my view, a progressive research strategy. So academics are right to carry on working with these models. But many academic macroeconomists go further than this. They argue that only microfounded DSGE models can provide a sound basis for policy advice. If you press them they will say that maybe it is OK for policymakers to use more ‘ad hoc’ models, but there is no place for these in the academic journals. In my view this is absolutely wrong for at least two reasons. First, models that are clearly still at the early development stage should not be used to guide policy when we can clearly do better. In this particular case we can easily do better just by using ad hoc social welfare functions on top of an existing DSGE model. (The Lucas critique does not apply, which is why I like this example.) Yes these hybrid models will be ‘internally inconsistent’, but they are clearly better! Second, to confine academics to just doing development work on prototype experimental models is stupid: academic economists can have many useful things to say starting with aggregate models (as here, for example), and this is not something that policymakers alone have the resources (or sometimes the inclination) to do. (We also know that academics will give policy advice, whatever models they use!) Analysis using these more ad hoc but realistic models should be scrutinised in high quality academic journals. Let’s be even more concrete. Take the debate over whether we should have a higher (than 2%) inflation target (or some other kind of target), because of the risks of hitting the zero lower bound. If this debate just involves micofounded DSGE models which clearly overweight inflation relative to unemployment, then these models will be guilty of distorting policy. This is not a matter of running some variants away from microfounded parameters (as in this comprehensive analysis, for example), but adopting realistic parameters as the base case. If this is not done, then microfounded DSGE models will be guilty of distorting this policy discussion. A few elderly bloggers, who use both DSGE and more ‘ad hoc’ models and think the critics have a point, are regarded by at least some academics as simply past their sell-by date. The macroeconomic case for not cutting the deficit straight after a major recession is as watertight as these things get, at least outside of the Eurozone. (It is also true for the Eurozone, but just a bit more complicated, so its easier to just focus on the US and UK in this post.) If you want to bring the government deficit and debt down, you do so when interest rates are free to counter the impact on aggregate demand. As the problems of high government debt are long term there is no urgency for debt reduction, so the problem can wait. The costs of fiscal consolidation in a liquidity trap are large and immediate, as we have experienced to our cost. Sometimes austerity proponents will admit this basic macroeconomic truth, but say that it ignores the politics. Politics means that it is very difficult for governments to reduce debt during booms, they say. Although it would be nice to wait for interest rates to rise before cutting the deficit, it will not happen if we do, so we have to cut now. Like all good myths, this is based on a half truth: in the 30 years before the recession, debt tended to rise as a share of GDP in most OECD countries. And it always sounds wise to say you cannot trust politicians. However both the UK and US show that this is not some kind of iron law of politics. In the UK debt came down from over 100% of GDP between the wars to less than 50% of GDP by the mid-1970s, and was lower still before the recession. (Debt was lower before the recession than when Labour came to power in 1997.) US debt also fell sharply after WWII, but rose again under Reagan and Bush, fell under Clinton and then rose again under the other Bush. So the empirical evidence on US and UK debt is not that it is inherently difficult to reduce in booms; it is do not elect Republican presidents. My reason for returning to this issue was thinking about the post 2015 UK election plans of all three main political parties. As I have outlined before, all involve tight fiscal control - in my opinion tighter than would be prudent from a macroeconomic point of view. This is fully six years after the recession. So it looks like politics is capable of promising fiscal consolidation well after a crisis. Are we meant to believe that if instead of austerity we had had additional fiscal stimulus after the recession, within the framework that Jonathan Portes and I suggest, things would have been quite different by 2015? It is true that no party is - as yet - telling us exactly how these numbers would be achieved, but this does not mean it will not happen: the Conservatives delivered in 2010, and Labour broadly stuck to its fiscal rules until the recession. The only party to go back on their election promises were the LibDems, who campaigned for less austerity than they ended up delivering. Price stability is the primary objective of the ECB, as laid down in the Treaty on the Functioning of the European Union, Article 127 (1). The ECB gets to choose how to interpret price stability, and it does this as “inflation rates below, but close to, 2% over the medium term.” Why ‘below but close to’? If this means 1.8% or 1.9%, it would seem very odd. How do the ECB know that 1.8% inflation is the right target? I suspect the answer is that this formulation is a compromise, between those who wanted a commitment to inflation below 2% (which could mean zero) and those that wanted just 2%. Is this constructive ambiguity? I cannot see how it can be. The whole point about inflation targeting is to provide a clear signal about the objectives of the monetary authority. Are these views of the past? Or do some who continue to sit on the Governing Council still have sympathy for these views? Is this about principle, or national interest: ECB rates were cut substantially when the German economy was weak in 2002-5, rather than let inflation fall below 2%. Speculation of this kind is fine for those who make money from it, but inflation targets should be clear and unambiguous. Allowing people to believe that maybe the ECB is not too bothered about below 2% inflation could be very dangerous because of the zero lower bound. The solution to this problem seems terribly straightforward. All the academic discussion is about whether inflation targets should be higher than 2%, not lower, because the chances of hitting the zero lower bound are clearly greater than had been thought. With Stark and others no longer there, perhaps the ECB can agree (by majority vote if necessary) to target just 2%, and those that cannot abide by that decision can leave - as Stark officially did - for 'personal reasons'. If the ECB cannot do this by themselves, then Eurozone governments should tell them to do this. I have never understood why the inflation target itself should be something that is decided behind the closed doors of central banks. One final thought on the Stark article. He too uses the phrase “Anglo-Saxon economists”. I am at a loss to know what this is meant to signify. For a few who comment on my posts it means that we are part of a plot to ensure the Eurozone fails, but is this what Stark means? Perhaps there is some reason why the theories of economics developed in the UK and US do not apply in the Eurozone. However the work I have seen done by ECB economists would not look out of place if done at the Fed or IMF, and from his experience Stark must know this. Some people refer to ordoliberalism. But if ordoliberalism differs from Anglo-Saxon neoliberalism in theory rather than practice, it seems to me this is because it takes more rather than less notice of mainstream economics. If it means disagreeing with almost everything in the paragraph of his quoted above, then I think many non-Anglo-Saxon economists would be in that group. Perhaps, like the phrase ‘below but close to 2%’, we will never know quite what it means. A constant refrain, from both the Conservative and LibDem party conferences, is how the current government saved the country from a crisis. Here is Osborne: “Four years ago, our economy was in crisis, our country was on the floor.” Or LibDem Danny Alexander: “We’ve seen the economy through its darkest hour ..” Now someone from outside the UK would immediately think Osborne and Alexander had got their counting wrong: the Great Recession was in 2009, which was five not four years ago. But of course they do not mean that little old crisis - they are talking about the Great Government Debt crisis. The only problem is that this debt crisis is as mythical as the unicorn. The real crisis was the Great Recession. And if any politicians can claim to have saved the country from that crisis, it is Labour's Gordon Brown and Alistair Darling. They introduced stimulus measures (opposed by Conservatives) that helped arrest the decline in GDP. By 2010, which is when Osborne took over, the economy was growing by nearly 2%. But surely there was a debt crisis in 2010? Indeed there was, in other countries. Crucially, these were countries that could not print their own currencies. This became apparent when interest rates on Greek debt went through the roof. Interest rates on UK and US government debt after the recession stayed well below levels observed before the recession. UK and US governments never had any problems raising money, for the simple reason that there was never any chance they would default. So wrong time, wrong country, but also maybe wrong people. Consumers and firms in the US and UK did feel they had borrowed too much, or wanted to save more, as a result of the financial crisis. The personal savings ratio in both countries rose substantially, and stayed high for a number of years. But people need something to save, like government debt. Which is one reason why interest rates on UK and US government debt stayed low: although the supply of that debt increased, the demand for it was increasing even faster. So why do we not hear Labour claiming that they saved us from a crisis - at least their crisis was real! Why do claims that the current government saved us from an entirely mythical crisis generally go unchallenged? Such claims are the equivalent to the Republican Congress claiming they saved the US economy. Welcome to the strange world of mediamacro. What the media should be doing, the next time this government claims it saved us from the Great Government Debt crisis, is to borrow a phrase from Jim Royle: crisis my arse! In the textbooks it is suggested that Keynesian economics is what happens when ‘prices are sticky’. Sticky prices sound like prices failing to equate supply and demand, which in turn sounds like markets not working. Hence whether you believe in Keynesian theory depends on whether you think markets work, so it obviously maps to a left/right political perspective. Reality is rather different. Suppose we start from a position where firms are selling all they wish. Aggregate demand equals aggregate supply. If then aggregate demand for goods falls, perhaps because consumers or firms are trying to rebuild their balance sheets after a financial crisis, producers of these goods will start to reduce output, and lay off workers. The idea that they would ignore the fall in demand and just carry on producing the same amount is ludicrous. So output appears to be influenced by aggregate demand at least in the short run, which is at the heart of what most economists think of as Keynesian theory. So where do sticky prices come in? Here we have to go back to the textbooks, and to an imaginary world where the monetary authority fixes the money supply. Firms, in an effort to stimulate demand for their goods, cut prices. Lower prices mean people do not need to hold so much money to buy goods. However if the nominal money supply is fixed, interest rates will fall to encourage people to hold more money. The textbooks encourage us to think of a market for money, with interest rates as the price that equates supply and demand. Lower interest rates provide an incentive to consumers and firms to increase demand, which in turn raises output. Now suppose that firms carry on cutting prices as long as they are selling less than they would like. The process just described will continue, with interest rates getting lower and aggregate demand rising in response. The process stops when firms stop cutting prices, which means aggregate demand has increased back to its original level. Suppose further that prices adjusted very quickly. This mechanism would work very quickly, so we would only observe aggregate demand being below supply for very short periods. If prices were extremely flexible, we could ignore aggregate demand altogether in thinking about output. Hence aggregate demand matters only if ‘prices are sticky’. Note that this correction mechanism is quite complex, and some way from the simple microeconomic world of the market for a single good. But we need to move back to the real world again. Monetary authorities do not fix the money supply; they fix short term interest rates. So they are directly in charge of the correction mechanism that is at the heart of this story. If central banks had some way of knowing what aggregate supply was, and also had perfect knowledge of aggregate demand and how interest rates influenced it, they could make sure aggregate demand equalled supply without any need for prices to change at all. Equally, if prices were very flexible but the monetary authority always moved nominal rates in such a way as to fail to stimulate aggregate demand, aggregate demand and therefore output would not return back to equal aggregate supply. Demand would still matter, even with flexible prices. Once you see things as they are in the real world, rather than as they are portrayed in the textbooks, the importance of aggregate demand (and therefore of Keynesian theory) is all about how good monetary policy is, and not about sticky prices. If monetary policy was perfect, then Keynesian theory would only be used by central banks in order to be perfect, and everyone else could ignore it. Of course for many good reasons monetary policy is not perfect, and so Keynesian theory matters. We could re-establish the link between Keynesian theory and price flexibility by assuming the monetary authority follows a rule which would make policy perfect if and only if prices moved very fast, but the key point remains. The importance or otherwise of Keynesian theory depends on monetary policy. It is not about market failure. Keynesian economics is not left wing, but it is about how the economy actually works, which is why all monetary policymakers use it. It is also common sense, which is why I’m often perplexed by those who dispute Keynesian ideas. Now maybe they are confused by the strange world portrayed in textbooks, but even if they think it is all about ‘sticky prices’, the evidence that prices are slow to adjust is overwhelming, so it is hard to dispute Keynesian theory on those grounds. Yet a whole revolution in macroeconomic theory was based around a movement that wanted to overthrow Keynesian ideas, and build models where this correction mechanism I described happened automatically. The people who built these models did not describe them as assuming monetary policy worked perfectly: instead they said it was all about assuming markets worked. As a description this was at best opaque and at worst a deliberate deception. So why is there this desire to deny the importance of Keynesian theory coming from the political right? Perhaps it is precisely because monetary policy is necessary to ensure aggregate demand is neither excessive nor deficient. Monetary policy is state intervention: by setting a market price, an arm of the state ensures the macroeconomy works. When this particular procedure fails to work, in a liquidity trap for example, state intervention of another kind is required (fiscal policy). While these statements are self-evident to many mainstream economists, to someone of a neoliberal or ordoliberal persuasion they are discomforting. At the macroeconomic level, things only work well because of state intervention. This was so discomforting that New Classical economists attempted to create an alternative theory of business cycles where booms and recessions were nothing to be concerned about, but just the optimal response of agents to exogenous shocks. So my argument is that Keynesian theory is not left wing, because it is not about market failure - it is just about how the macroeconomy works. On the other hand anti-Keynesian views are often politically motivated, because the pivotal role the state plays in managing the macroeconomy does not fit the ideology. Is this asymmetry odd? I do not think so - just think about the debate over climate change. Now of course it is true that there are a small minority of scientists who do not believe in manmade climate change and who are not politically motivated to do so, and I’m sure the same is true for Keynesian theory. But to claim that the majority of anti-Keynesian views were innocent of ideological preference would be like – well like trying to pretend that monetary policy has no role in stabilising the business cycle. There are of course many differences between climate change denial and anti-Keynesian positions. One is the extent to which the antagonism has infiltrated the subject itself. Another is the extent to which the mainstream wants to deny this influence. I do wonder if the unreal view of monetary policy that remains in the textbooks does so in part so as to not offend a particular ideological position. I do know that macroeconomics is often taught as if this ideological influence was non-existent, or at least not important to the development of the discipline. I think doing good social science involves recognising ideological influence, rather than pretending it does not exist.